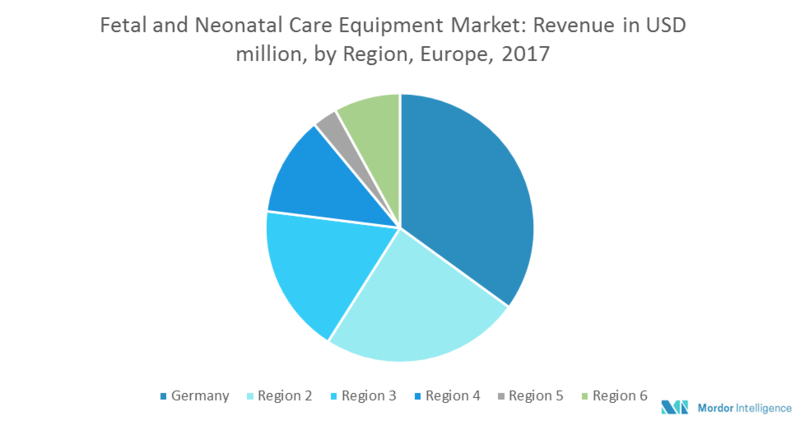 The Europe fetal and neonatal care equipment market has been estimated to register a CAGR of 6.2% during the forecast period of 2018–2023. Fetal and neonatal care is primarily focused towards the child’s health and diseases from the perinatal period to adolescent stage. With advanced healthcare facilities, large patient population, and rising number of hospitals, Germany is expected to witness the highest CAGR. The rise in the preterm and low-weight births of newborns is one of the major factors for the growth of the fetal and neonatal care equipment market. According to the European Foundation for the Care of Newborn Infants, the prevalence rate of premature birth ranges from 5.5 to 11.4% with an average of 7.1% of all live births. With that 40% of all neonatal deaths were of babies born before 28 weeks of gestational age. Factors such as the lack of standardization in classification in the registration of births and deaths, and misclassification of stillbirths and neonatal deaths often make it difficult to compare the mortality in this region. In some countries of Europe, 24 weeks is the cut-off point for gestation while other countries follow 28 weeks as per the World Health Organization (WHO). Thus, these factors augment the demand for better fetal and neonatal care equipment market. Other major factors responsible for the growth of this market are the rise in the technological advancements in neonatal care products and the rising demand for mobile medical units with increased global awareness for prenatal and neonatal care. The high birth control in Europe is leading to low fertility rate, which is one of the primary obstacles to the growth of fetal and neonatal care equipment market. According to an article published in 2015, in the Guardian, Spain has the lowest fertility rate in the European Union with an average of 1.27 children born for every woman of childbearing age. It has directly affected the Spanish population causing its shrinkage since 2012. Germany has the lowest birth rate in the world, which was around 8.2 per 1000 population during 2008–2013. Thus, high birth control in the region coupled with stringent regulatory policies for new device approvals, and high cost associated with neonatal care are likely to impede the growth of this market. Germany is expected to register the highest CAGR in the forecast period. The rise in the number of hospitals, rising frequency of acquired infections in the newborn babies and a huge patient population of preterm babies and low-weight babies are increasing the demand for neonatal care in the country. With favorable regulations and increased adoption of advanced technology, the United Kingdom is expected to lead the market. March 2018: Incereb, a Dublin-based MedTech company secured EUR 50,000 investment for neonatal devices to be used in NICUs. The major players include Atom Medical Corporation, Becton, Dickinson and Company, Dragerwerk AG & Co., KGaA, GE Healthcare, Koninklijke Philips N.V., Masimo, Medtronic PLC, Natus Medical Incorporated, Phoenix Medical Systems (P) Ltd, and F. Hoffmann-La Roche Ltd, among others. Follow the current and future of the Europe fetal and neonatal care equipment market in the developed and emerging markets.